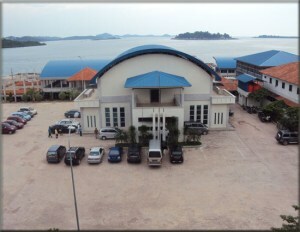 Barelang Seafood Restaurant is one of the largest seafood restaurant in the city of Batam. It serves various kinds of dishes typical of the sea, consisting of crab, shrimp, fish, Cuttlefish / squid, Gong-gong, Snails etc. are where this restaurant cook it in a previous state of the living (Life Seafood). Coinciding next Barelang Bridge 1 which has stunning scenery, blue water, and the small islands that looked at various angles view of the restaurant made the atmosphere in the restaurant was to be very beautiful so that will make your meal to be much more enjoyable and comfortable . Barelang seafood restaurant has 3 places to eat, ie View that has 4 dining table located at the end of the restaurant, to coincide with the cage so you can instantly choose seafood that you like. And where to eat The restaurant is frequently used for the public is the Hall has 63 Mealtime so very suitable for various events such as wedding events, birthday event personal / company, or lunch / dinner you. And also has a restaurant / dining room VIP (table 9), which has a variety of facilities in it so it is suitable for those who want to hold corporate meetings or business meetings, and can also be used for a single meal your family.